These days there is plenty bad news in Hollywood about broken marriages and dysfunctional families, so we are always eager to hear a love story. This one features Cameron Diaz husband, so lets catch up on the juicy details of how they met and everything that led the couple to the altar last January. For those of you who had no idea, our girl Cameron tied the knot on January 5, 2015. Who did she marry? His name is Benjamin Levi “Benji” Madden, he was born on March 11, 1979 and he is the guitarist for the band Good Charlotte, as well as pop rock collaboration The Madden Brothers. Theirs was a whirlwind romance, but we will try our best to catch you up. So, the couple did not bump into each other at an A- list event and have sparks fly between them, it was nothing as dramatic as that. 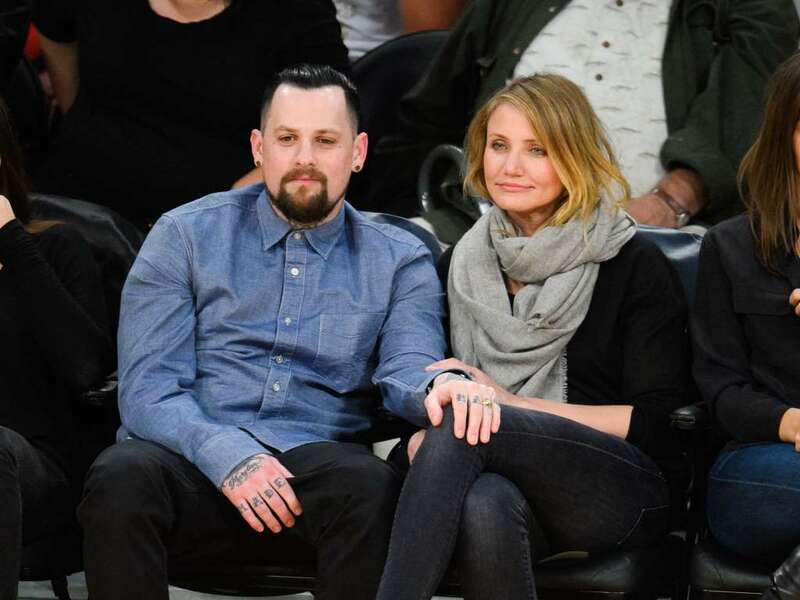 The two were actually introduced by Nicole Richie, who is married to Benji’s twin brother, Joel Madden. Although Cameron knew Joel and Nicole for years, she never really crossed paths with Benji. They first formally met at a dinner party thrown by Cameron, Joel asked if he could invite his brother and when he did, the actress couldn’t help thinking, ‘He’s hot’. Apparently the two hit it off instantly, hence the reason theirs is termed a whirlwind romance. So that’s how Cameron Diaz husband came into the picture. After a brief 8 months they decided they wanted to take it to the next level and we don’t mean getting a pet together, they made it official and got hitched. What did their matchmaker have to say about this? ‘ I approve of anything that’s going to make Benj happy, I am a devoted sister-in-law.’ The wedding was pretty intimate, even with a guest list of just over 90 people. We sure hope it lasts, the world needs more happy love stories. You may not hear that much about her, but Cameron has a sister who is a whole two years older than her. Her sister’s name is Chimene and once you see a picture of the two, it’s practically impossible to not know that they are sisters. She may not be famous like her younger sister, but it’s no doubt that Chimene and Cameron draw their looks from the same gene pool. Chimene is married to the country rock musician, Robby Armstrong and the couple live together in Huntington Beach with their four children. Chimene and her husband Robbie are also involved in various causes, though they have plenty on their plate, with their kids and their careers, they don’t neglect to speak up for a worthy cause when they see one. One of such causes is, “Children Today”, a Long Beach non-profit organization that feeds homeless children and provides special, early learning opportunities for disadvantaged youth. So you know just how dear it was to the couple, Robbie threw a concert to help generate funds for the Non Profit Organization. This isn’t out of the ordinary for the couple who often go out of their way to raise funds for causes they believe in. When it comes to people as a whole, we rarely notice their feet, their shoes we most definitely do, but feet go quite unnoticed. So this section is for all the foot lovers out there, we have your back today. Cameron is one of those women out there who has had her feet looked at, scrutinized and observed. For her choice of shoes she was given three and a half stars out of five, for the shape of her foot and toes she was given four stars, then for the quality of her pedicure she was given three and a half stars. So overall, the actress has four stars out of five which means she has pretty neat feet. Who was the judge on the jury on this, well its her fans and haters alike, so now you know her feet don’t lie.